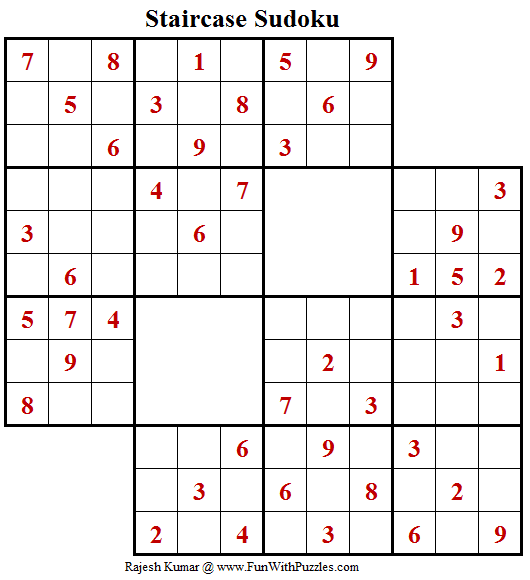 Staircase Sudoku is also known with another name called Expanded Sudoku. In fact earlier Sudoku Puzzle of this type is published with name Expanded Sudoku. This Sudoku I submitted for World Sudoku Championships 2017. However we decided to put Sudoku puzzles of only 9x9 size, so this puzzle was not included in this championship. After a long gap of more than one year, I am publishing Sudoku puzzle in Daily Sudoku League. From now onward I will be regular in posting puzzles in this league. I am publishing this Staircase Sudoku puzzle as part of Daily Sudoku League as 208th Sudoku puzzle in this series. This Staircase Sudoku Puzzle I am publishing as #208th Sudoku puzzle in The League of Extraordinary Ladies & Gentlemen. Here are the next are previous Sudoku puzzles published in this series.